`The Standards for TB care in India explains the TB treatment in India that should be provided for all people with TB. It was published in 2014 and explains the TB treatment that should be provided for all patients with TB. This includes people in special groups, such as those with TB and HIV co-infection. Later the Technical & Operational Guidelines for Tuberculosis Control in India 2016 was produced. This document does not replace the Standards for TB Care in India. It does update it as well as expand it. In particular it makes it clear that the Standards for TB Care in India applies to all patients including those in the private sector. It is very important that patients receive the correct TB treatment. This usually means that they must receive the correct TB drugs, as surgery is not very often used for TB treatment. By the time that a person has been diagnosed as having TB disease they should know whether they have pulmonary or extra pulmonary TB. Most people will have pulmonary TB. Pulmonary TB is TB in the lungs. Extra pulmonary TB is TB involving any organ apart from the lungs. It is also very important that a patient, or someone close to them, is able to say whether they have ever had any TB treatment before. If you have had TB treatment before, you will probably need to take different TB drugs to those people who have never had TB treatment before. It is also important to know if there is any possibility that you have drug resistant TB. There is more about drug resistant TB in India. a) New TB patients - these are TB patients who have never had treatment for TB or they have taken anti TB drugs for less than one month. b) Previously treated patients - these are patients who have received one month or more of anti TB drugs in the past. Recurrent TB patients are patients who have previously been considered as successfully treated (cured/treatment completed) and they have subsequently been micro biologically confirmed as still having TB. Treatment after failure patients are those who have previously been treated for TB and their treatment failed at the end of their most recent course of treatment. Treatment after lost to follow-up is a TB patient who has previously received TB treatment for a month or more and they were declared lost to follow up in their most recent course of treatment. They have also subsequently been found to be a microbiologically confirmed TB case. Other previously treated patients are patients who have previously been treated but whose outcome after their most recent course of treatment is unknown or undocumented. c) Transferred in - is a TB patient who is received for treatment in a TB unit, after being registered for treatment in another TB unit. A micro biologically confirmed TB case refers to a patient who is presumed to have TB and who has a biological specimen positive for acid fast bacilli. It is also a patient positive for TB through a quality assured Rapid Diagnostic Molecular test, such as CBNAAT. The groups, or categories, are similar to, but are not exactly the same as the WHO Treatment categories. All new TB patients in India should receive an internationally accepted first line treatment regimen (a regimen is the prescribed course of treatment, in this case the TB drugs) for new patients. The initial intensive phase should consist of eight weeks of the drugs Isoniazid (H), Rifampicin (R), Pyrazinamide (Z) and Ethambutol (E). The continuation phase should consist of the three drugs Isoniazid, Rifampicin and Ethambutol given for another sixteen weeks. This is alternatively written as 2HREZ/4HRE. There will be no need for any extension of the continuation phase. The drug dosages should be given according to the body weight of the patient. There are four weight band categories. All patients should receive their daily TB drugs under direct observation (DOTS). Under DOTS (Directly Observed Therapy Short Term) the patient has to take the TB medication in front of a DOTS agent. The DOTS agent is usually a volunteer from the patient’s community, and may be a family member. DOTS does not say which drugs should be taken. 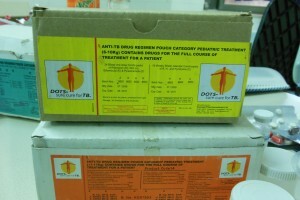 DOTS applies when any TB drugs are taken with the patient being observed by a DOTS volunteer. A fixed dose combination (FDC) is when two or more drugs are combined together in a single pill or tablet. Fixed dose combinations are helpful as they simplify getting TB drugs and the delivery of DOTS. They may also increase adherence. Individually worked out drug dosing should be only used for patients with toxicities or contraindications to one or more parts of the FDC. Fixed dose combinations of four drugs (Isoniazid, Rifampicin, Pyrazinamide and Ethambutol), three drugs (Isoniazid, Rifampicin and Ethambutol) and two drugs (Isoniazid and Rifampicin) should be available. There is more about FDCs. When it started to provide drug treatment the RNTCP only provided treatment on three days a week. In 2014 the RNTCP recognised the need for daily dosing and announced a pilot in five states in December 2014. It was however very delayed. Three years later in 2017 the pilot was finally due to start. By this time most private sector physicians were providing their patients with a daily TB drug regimen. It was said that the delay in the rollout was “due to delays in procurement of the medicines needed for treatment”. In February 2017 the Supreme Court directed that after a period of nine months, all new patients should be administered a daily regimen of TB drugs. A TB specialist Dr Raman Kakkar sought a change in the protocol for the treatment of TB. He had claimed that the current dosage practice was “unscientific” and “improper”. It promoted relapse and generated drug resistant strains in the patients. The relapsed cases were harder to treat than first time infections. However, as the drug regimen goes from three times a week to daily, more monitoring of patients may be required, as with the increased doses the patients may have more side effects. 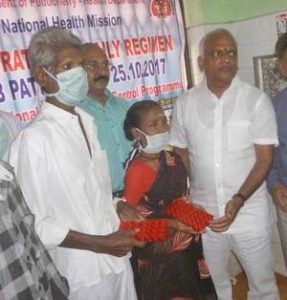 www.thehindu.com/news/cities/puducherry/new-drug-regimen-for-tb-patients/ The quantity of the drugs to be taken will also depend on the patients weight. Each patient will receive through the RNTCP a month’s supply of drugs. The patients will be supervised taking the drugs using the DOTs strategy. The daily regimen will have to be followed by patients for six to eight months. Each patient with TB in India is now to receive R500 ($8) a month for food. This is because under nutrition is a risk factor for TB in India. There is more about Nutrition & TB and Food & TB. It is with previously treated patients that there have been most changes over the last few years to the recommended treatment. Previously streptomycin was given to many previously treated patients and many patients lost their hearing as a result of the side effects of the drug. The treatment provided was to be as set out in the Programmatic Management of Drug Resistant Tuberculosis (PMDT) in India. However, in December 2018 an announcement was made that all previously treated patients should receive a standard six month first line treatment if no resistance was detected to either rifampicin or isoniazid.2"8-month TB treatment for previously treated patients cut to six months", Times of India, 24/12/2018, https://timesofindia.indiatimes.com/city/meerut/8-month-tb-treatment-for-previously-treated-patients-cut-to-six-months/articleshow/67235940.cms This brings the TB treatment in line with the WHO treatment advice. It is however very important to ensure that drug susceptibility testing is carried out to ensure that the previously treated patient does not have any drug resistance. The World Health Organisation (WHO) changed their advice for the treatment of previously treated patients in 2017.3"Guidelines for treatment of drug-susceptible tuberculosis and patient care (2017 update)", WHO, 2017, https://www.who.int/tb/publications/2017/dstb_guidance_2017/en/ Their advice now is that patients who require retreatment should never be given streptomycin unless it is part of a regimen for drug resistant TB when no other drug is suitable. Patients who require retreatment should always be referred for a rapid molecular test or drug susceptibility testing to determine if they have drug resistance. If the drug susceptibility testing shows that they have no drug resistance, then the six month first line treatment regimen (2HRZE/4HR) can be repeated. If drug resistance is present, then an MDR-TB regimen should be prescribed according to WHO's drug resistant TB guidelines. There are some difficulties when testing for second line drugs is not available, so this should be made available urgently. The TB drugs for RNTCP patients are supplied in an individual patient wise box which contains the entire course of treatment for the patient. In each patient wise box there are two pouches. One is for the intensive phase and the other is for the continuation phase. The patient wise boxes are colour coded. Red boxes are for new patients, sometimes referred to as category 1. Blue boxes are for previously treated patients and are sometimes referred to as category 2. For paediatric TB patients separate patient wise boxes have been developed. The terminology for treatment categories of patients is slightly confusing. The World Health Organisation (WHO) has also had treatment categories for patients. In the same way that the use of the term Treatment Categories is no longer used by the WHO, so the phrase Categories of Treatment is no longer used in India. The response to therapy in patients with pulmonary TB, both new and retreatment patients, should be monitored. This should be done by follow-up sputum microscopy/culture (one specimen) at the time of completion of the intensive phase of treatment and at the end of treatment.